Your beloved boxer's wrinkles are bacteria magnets. Your boxer's wrinkles provide cuteness and character, and they're part of his charm. The downside is that those wrinkles are a prime site for bacterial skin infections. If you notice irritated skin accompanied by a foul odor, your boxer dog is probably suffering from infection. It's time for a vet visit. Anywhere your boxer has skin folds, bacteria can invade and grow. If your boxer is overweight, he's an even more likely candidate for pyoderma, another term for skin infection. The skin folds rub together, creating irritation and later inflammation. The infected skin gives off a foul odor, and there might be a discharge. Among the most frequent forms of pyoderma in boxers is lipfold pyoderma, in the folds beneath the lips and jaw. The skin in this area is generally moist because of the dog's drinking and eating, so it's even easier for bacteria to flourish. Not only is the area under his mouth red, but it stinks, and he might exhibit bad breath. You'll probably notice your dog pawing at his face for relief. Your vet prescribes a shampoo containing benzyl peroxide. After you use this shampoo on the affected skin folds, dry your boxer dog's skin thoroughly. Your vet will also give you an antibiotic cream to get the inflammation under control. In addition, your dog might receive a steroid injection or pills. Recurrence is common, so you might need to apply special creams or ointments regularly to get rid of bacteria. If your boxer's pyoderma doesn't clear up with conventional treatment, it might require surgery. 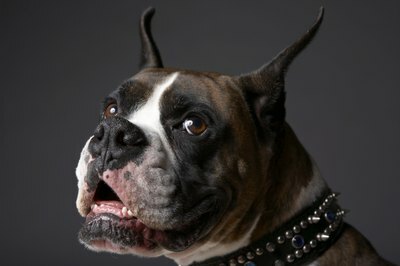 According to VCA Animal Hospitals, surgical removal of the skin folds is most often done on flat-face breeds such as boxers. After he recovers, he might not have quite as many adorable wrinkles but he'll probably have much healthier skin. Get your boxer used to skin fold cleaning from puppyhood. Keeping his wrinkles clean and dry is the best preventive for the misery of pyoderma. Check his folds several times a week. By the time his skin folds start to smell, the infection is well established. Open the wrinkles and look at them. If you spot any redness, gently clean out the wrinkle. Put medication recommended by the vet on the lesion until it heals.